Edit: this blog was created to monitor small watch projects that do respect intellectual property. After consideration, we feel that the founder of Stølås watches did not take enough measures to distance its design from the one he seemingly took inspiration from. We therefore remind the readers of the risk of confiscation and possible fines they might find themselves subject to, should they chose to purchase a product that classifies as counterfeit. We don’t question the entrepreneurship of Mr Stølås or his willingness to comply with tax laws, but we disagree with his aesthetic choices. 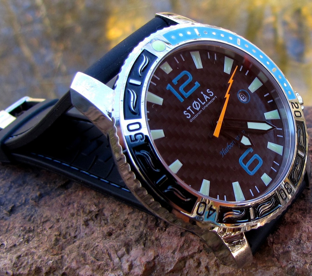 Curtis Stølås celebrated his Scandinavian heritage by giving his family name to the watch brand he launched. OceanicTime features images of the first collection, which is sourced overseas but designed and assembled in the USA. Available in three different finishing, the design of the Harbormaster raises an eyebrow for its heavy reminiscence of the Ulysse Nardin Marine Diver, a design that might still be covered by intellectual property protection. New projects are always welcomed, but I hope there is an undisclosed agreement between Stølås and Ulysse Nardin regarding the design similitudes. Otherwise Mr. Stølås’ aesthetic decisions might have led him into an area where he risks a huge slap on the hands.